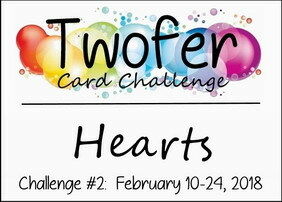 Today, I'm playing in the Twofer Card Challenge #2 - Hearts... a new and very creative opportunity for card making developed by Darnell and her design team. How fun to design two different cards with different themes using the same stamp and/or die. My two cards use one of the MFT Stitched Heart Stax Die-namics as the common element. Card 1 - a very CAS creation - an alcohol ink blended panel was used to die-cut a heart. The sentiment was die-cut three times using MFT Slate Grey cardstock and the MFT Joy die. The sentiment layers were glued together and painted with a couple coats of clear WOS. A few clear sequins complete the card. Card 2 - the same MFT Stitched Heart Die-namic was used to cut a heart from MFT Electric Red card stock. The heart was embellished with Distress Ink die-cuts using Sizzix (Tim Holtz) Gear Head dies. A die-cut arrow and a stamped Hugs sentiment complete the card. Thank you for visiting ... always appreciate your feedback. PS Thought you would like to know, your link at Twofer took me to a blank page ... not sure why. You may be able to relink with this post and delete the original, so that others can find you! Thank you for your comments. I don't know why my link went to a blank page. Yesterday, I tried deleting the original a couple of times and reposted, and the blank page still showed. I will keep working on it. Fantastic use of the same die to make two wonderful card designs. Love the alcohol inked heart surrounded by all that white space! The gears in the red heart look fabulous on the second card! That was an oops on my part ... thank you. Two beautiful heart cards Marilyn! LOVE the colours of your alcohol inks hearts --- gorgeous with the large and sparkly JOY sentiment. Your second card is so cook with the gear die-cut on top of the red heart. I need to go buy that gear die!! :) Thanks for joining us at Twofer Card Challenge!